Follow the author as he goes on a harrowing journey from the US Olympic Training Center to homeless shelters to shooting heroin on the job to being declared dead. This story goes beyond addiction. It is about the fragility and tenacity of the human spirit and how that spirit can redeem each and every one of us by helping to push us through the darkness, whether the darkness is from death, divorce, or the disease of addiction. Acrobaddict is a story about the close relationship between athletics and drug addiction—how the same energy, obsession, and dedication that can create an Olympic athlete can also create a homeless drug addict. 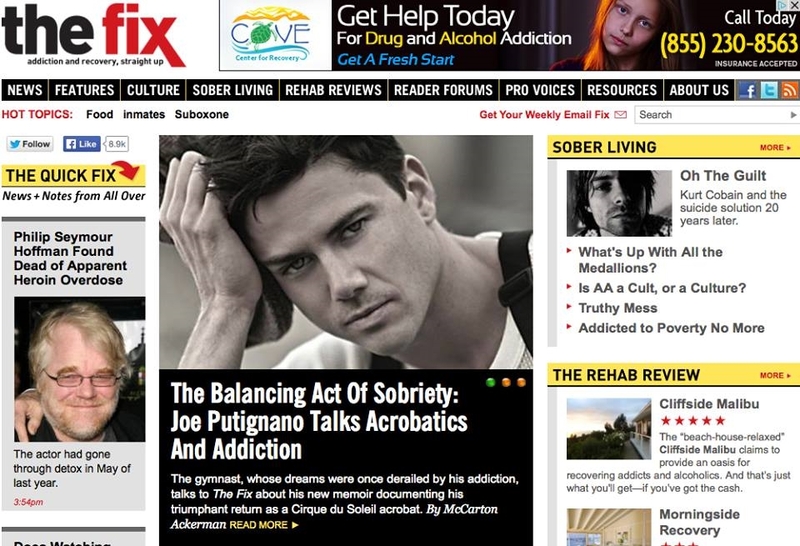 Joe Putignano talks to Dr. Sanjay Gupta on CNN, about his memoir Acrobaddict and heroin addiction. “You will not read a more candid book this year. Prepare to be frightened and taken to the depths of despair and then lifted up triumphantly. It is never too late to hit the reset button on your life–that is what you are about to learn from Joe Putignano . He is equally adept at taking you through the remarkable journey of his own terrible addiction as he is in the world of acrobatics, descending from the Cirque du Soleil big top as a human mirror ball–the figurative spark of change in humanity. Joe Putignano talks to Anderson Cooper, on AC360 about heroin addiction and his memoir Acrobaddict. 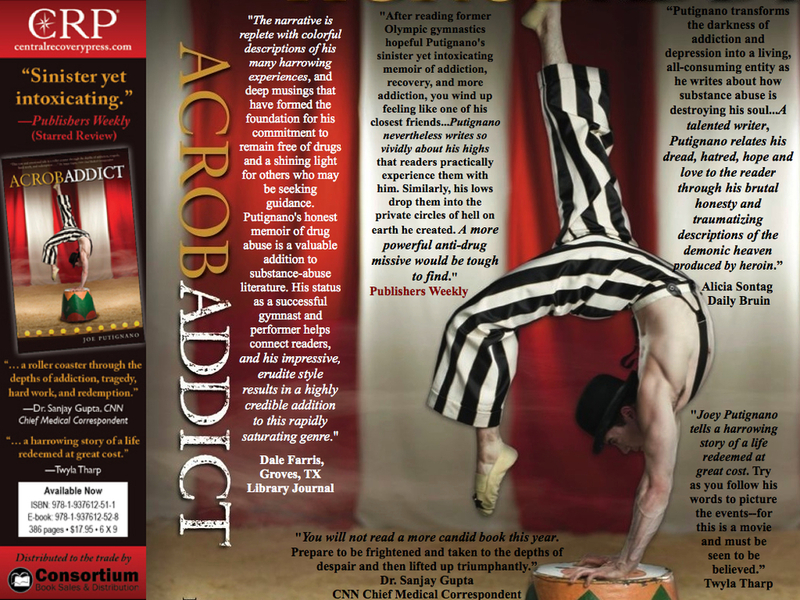 Acrobaddict can be purchased at Barnes & Noble, Amazon, Itunes, and your local book store. 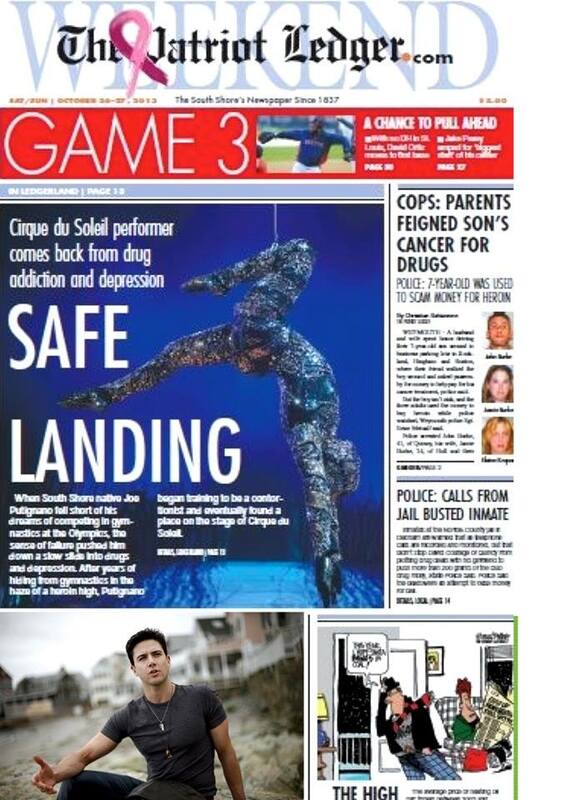 Boston, MA Patriot Ledger, features Joe Putignano on the cover, and in a featured article about Acrobaddict and his past in Boston. Putignano, Joe. Acrobaddict. Central Recovery. Sept. 2013. 400p. ISBN 9781937612511. pap. $17.95; ebk. ISBN 9781937612528. MEMOIR (July 22, 2013) Dale Farris, Groves, TX–Former star acrobatic contortionist and gymnast of the Cirque du Soleil’s “Totem,” performer in Twyla Tharp’s musical The Times They Are A’changin, and guest on Dr. Sanjay Gupta’s CNN show Human Factor, Putignano, shares his heartfelt, emotionally wrenching story of addiction to heroin. Putignano’s memoir takes readers on an unsettling journey from his experience in the U.S. Olympic Training Center to homeless shelters to shooting heroin on the job, and even being declared dead. His vivid, brutally honest story begins with his realizing at an early age his innate talent for gymnastics, followed by his obsession with becoming an Olympic gymnastic champion, how he abandoned his Olympic hopes to chase his love of heroin, and ultimately how he managed to overcome his addiction and move into long-term recovery and stability. The narrative is replete with colorful descriptions of his many harrowing experiences, and deep musings that have formed the foundation for his commitment to remain free of drugs and a shining light for others who may be seeking guidance. VERDICT Putignano’s honest memoir of drug abuse is a valuable addition to substance-abuse literature. His status as a successful gymnast and performer helps connect readers, and his impressive, erudite style results in a highly credible addition to this rapidly saturating genre. Joe Putignano is currently working with Dr. Sanjay Gupta from CNN for a story about surgery and sobriety. Joe has undergone two extensive shoulder surgeries, but he cannot take any narcotic pain medication for it. Dr. Sanjay Gupta and Joe Putignano, are trying to raise awareness to the overprescription of narcotics, and help prevent addicts in recovery from relapsing. This story will air later this year.